Since debut album One was released to much critical acclaim prog metal pioneers TesseracT have been dogged with the departure of not one but two lead vocalists. While such adversity would have broken manly lesser acts, the Milton Keynes act picked themselves up and following the departure of American singer Elliot Coleman came across young Brighton based frontman Ashe O’Hara. The move has proved a shrewd one as O’Hara’s voice has a wealth of emotion and power that belies his cherub like appearance. 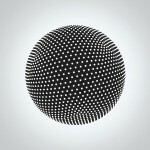 Following up such a resound praised record especially after such crippling circumstances TesseracT have refocused with a new album that retains the technically and emotional depth which made the debut so essential. Boldly hinged around the concept of ‘”The Law Of Conservation” which states energy is transferred between the four states of matter, mind, reality and energy the stabbing polyrthymic structures remain but with a greater emphasis upon melodic hooks. Altered State disowns any screaming vocals which were present on the debut which the band felt they need “in order to fit into the scene”. It’s a bold move but one that paid off well. Ashe’s delicate haunting notes more than match the unmistakable impression Dan Tompkins left on One with numbers like ‘Of Matter – Retrospect’ showing an emotional range rarely felt within the myopic scope of the average metal band. Familiar complex rhythms and patterns are present but the emphasis has shifted towards a more mature and reflective direction. O’Hara’s performance is simply stunning. First single ‘Nocturne’ is brimming with passion and sincerity. His angelic tones reaching for the heavens while the swirling mass of guitars churn malevolently beneath him. Considering the impact One had upon British metal TesseracT could be forgiven for resting upon their laurels yet Altered State expands their vision adding bold new elements. The elegant jazz saxophone on ‘Calabi-Yau’ is curveball and ‘Exile’ breaks new ground with some delicate acoustic chords further enhancing the reflective mood of the song. A couple of tracks standout from the pack but Altered State” is best experienced as a whole piece. Distilling and focusing all their frustrations into creating a record which transcends the boundaries of the subgenre they found themselves a part of TesseracT have become the benchmark for progressive acts the world over.